David Kenneth Harbour (born April 10, 1975) is an American actor. He is best known for his role as Jim Hopper in the Netflix science fiction horror series Stranger Things (2016–present), which has earned him a Critics' Choice Television Award in 2018. He has also received Primetime Emmy Award and Golden Globe Award nominations for the role. Harbour was born in White Plains, New York to parents Kenneth and Nancy (née Riley) Harbour. Both of his parents work in real estate, his mother in residential and his father in commercial. He attended Byram Hills High School in Armonk, New York, along with other actors Sean Maher and Eyal Podell. Harbour graduated from Dartmouth College in Hanover, New Hampshire in 1997. He was a member of Dartmouth's Sigma Phi Epsilon fraternity. Harbour began acting professionally on Broadway in 1999, in the revival of The Rainmaker. He then made his television debut that same year in an episode of Law & Order, playing a waiter. He appeared again in 2002 in an episode of Law & Order: Special Victims Unit, playing a child murderer. Harbour portrayed the recurring role of MI6 Agent Roger Anderson in the ABC series Pan Am. In 2005, he was nominated for a Tony Award for his performance in a production of Who's Afraid of Virginia Woolf?. Harbour is also known for his role as CIA Agent Gregg Beam in Quantum of Solace, as Shep Campbell in Revolutionary Road, and as Russell Crowe's source in State of Play. He also received praise for his role as spree killer Paul Devildis in a 2009 episode of Law & Order: Criminal Intent. Harbour's other film credits include Brokeback Mountain, The Green Hornet, End of Watch, and Between Us. In 2013, he played a small role of a head doctor in the television series Elementary. From 2012 to 2014, he also played the recurring role of Elliot Hirsch in The Newsroom. In 2014, Harbour played the recurring character of Dr. Reed Akley in the first season of the historical drama series Manhattan. He currently plays the lead role of Chief Jim Hopper in the Netflix science fiction horror series Stranger Things. For his role as Hopper, Harbour has received nominations for the Primetime Emmy Award for Outstanding Supporting Actor in a Drama Series (2017 and 2018) and the Golden Globe Award for Best Supporting Actor – Series, Miniseries or Television Film (2018). Harbour has won a Screen Actors Guild Award for Outstanding Performance by an Ensemble in a Drama Series (2017) along with the rest of the cast. Harbour portrayed the title character in the film reboot Hellboy (2019). He will also join Scarlett Johansson in the Marvel Cinematic Universe film Black Widow. Christopher Clark Episode: "Presumed Guilty"
Wesley John Kenderson Episode: "Silver Lining"
Gary Weber Episode: "Five Brothers"
Paul Devildis Episode: "Family Values"
Frank Ambrose Episode: "The Better Half"
Dan Samuels Episode: "It's Like Jamais Vu All Over Again"
Dr. Mason Baldwin Episode: "Lesser Evils"
Vietnam Memorial Head Episode: "Underdogs"
^ Blank, Matthew (December 14, 2010). 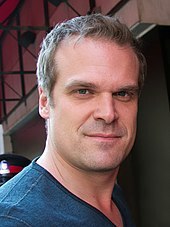 "PLAYBILL.COM'S CUE & A: Merchant of Venice's David Harbour". Playbill. Brightspot. Retrieved July 27, 2018. ^ Philpott, Herbert F. (February 2012). "The History of Sigma Phi Epsilon New Hampshire Alpha Chapter". Dartmouth SigEp. Retrieved July 27, 2018. ^ Fretts, Bruce (July 13, 2009). "Cheers & Jeers". TV Guide. p. 8. ^ Perry, Spencer (May 8, 2017). "Neil Marshall to Direct Hellboy Reboot Starring David Harbour!". Comingsoon.net. Retrieved May 8, 2017. ^ Kit, Borys (May 8, 2017). "'Stranger Things' Star David Harbour Joins Scarlett Johansson in Marvel's 'Black Widow' (Exclusive)". The Hollywood Reporter. Retrieved April 3, 2019. ^ Jones, Kenneth (June 5, 2005). "Just the Facts: List of 2005 Tony Award Winners and Nominees". Playbill. Archived from the original on October 20, 2012. Retrieved April 20, 2011. ^ "Relive the 23rd Annual SAG Awards". TNT Presents: The Screen Actor Guild Awards. A TimeWarner Company. Archived from the original on November 23, 2017. Retrieved February 17, 2017. ^ "Never mind Oscar, here's the 2017 FANGORIA Chainsaw Awards Nominees Ballot!". Fangoria. February 7, 2017. Archived from the original on February 8, 2017. Retrieved February 14, 2017. ^ Littleton, Cynthia (September 10, 2017). "Creative Arts Emmy Winners: 'Stranger Things,' 'Westworld,' 'Big Little Lies' Win Big — Complete List". Variety. Penske Business Media, LLC. Retrieved September 10, 2017. ^ Kilday, Gregg (December 6, 2017). "Critics' Choice Awards: 'The Shape of Water' Leads With 14 Nominations". The Hollywood Reporter. Retrieved December 7, 2017. ^ "Golden Globes: 'Shape of Water,' 'Big Little Lies' Top Nominations". The Hollywood Reporter. December 11, 2017. Retrieved December 12, 2017. ^ Piester, Lauren (July 12, 2018). "David Harbour's Puppy Pooped In Celebration of His Emmy Nom". E! Online. E! News. Retrieved July 13, 2018.